"It’s hard to say if this event that has been in the news is exceptional as compared to others due to the lack of historical data." A spate of lightning strikes struck Andhra Pradesh in April and May causing fear and destruction. 14 people were killed in just a day in different districts of Andhra Pradesh due to 41,025 lightning strikes. On April 24, 37,000 lightning strikes were recorded within 13 hours. However, last year, 30,000 lightning strikes were recorded throughout May. Local authorities say that such occurrences are unprecedented even for a region where lightning strikes are fairly common. Down To Earth spoke to the Chief Meteorologist, Mark Hoekzema and Jeff Lapierre from the lightning team at Earth Networks, a Maryland-based company which sends alerts to organisations around the world, including AP’s disaster management authority, as part of its aim to mitigate extreme weather event risks. A network of sensors located around the world by Earth Network measure radio frequencies emitted during lightning strikes. This data is combined to produce a time, location, type (cloud-to-ground or intra-cloud), and peak current using a time-of-arrival techniques similar to GPS. Whenever electromagnetic activity characteristic of a lightning strike is detected, a local disaster response team is notified, that further sends alerts. In AP, the state disaster management authority sends alerts on a mobile application, Vajrapath, developed by Kuppam Engineering College students in Chittoor in collaboration with the Indian Space Research Organisation. Andhra Pradesh recorded more than 40,000 lightning strikes in less than 24 hours on May 1. How unusual is this? India has bouts (of lightning strikes) with severe weather – especially in the pre-monsoon season which is occurring now. It happens more in the northern half where storms will form on the highlands and move into the very hot regions across the north. The hottest weather of the year in India occurs before the monsoon begins – and is in the spring months. I will say that the Central African region on average has the highest amount of lightning in the world. On a finer scale, Lake Maracaibo in Venezuela was the city with the most lightning in the world in 2017 at 158 flashes per square km per year. Scaling that to Andhra Pradesh (160,000 km2) and for 24 hours, that gives 69,342 flashes. So while this is an active storm, it is not the record breaking. I can also say that in the US, during the summers, there are definitely storms that produce lightning with similar electrical intensity. Was such a phenomenon seen before in the region? How frequent is it? I would say that while probably an above average storm, this is not uncommon for this time of year due to the monsoons. We don’t have statistics on the occurrences of severe weather like high winds, hail, etc. which are tracked closely in the US but not in India. That said, these events do occur each year. It’s hard to say if this event that has been in the news is exceptional as compared to others due to the lack of historical data. Where else are lightning strikes common? There are three major regions of lightning activity around the globe (called lightning ‘chimneys’). They are Central Africa (highest), South America, and Indonesia/Australia. Notice that all these areas are near the tropics. To a lesser extent, lighting is also very common in the US, China, and India, but is more seasonally dependent. 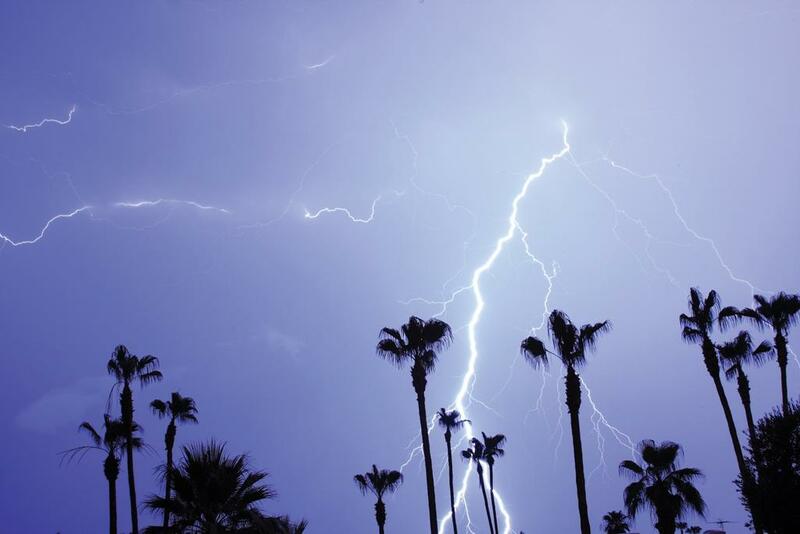 Can the occurrence of lightning strikes be accurately predicted? If so, how? The time and location of an individual lightning flash cannot be accurately predicted. However, the approximate region, start time, and duration of a thunderstorm can be predicted through meteorological forecasting. The potential for thunderstorm formation is possible through analysis and forecasting but the prediction of lightning occurrence – both in location and frequency is not possible at this time. Reg article: Andhra Pradesh lightning strikes were not record breaking, I feel the answers given byChief Meteorologist, Mark Hoekzema and Jeff Lapierre from the lightning team at Earth Networks, a Maryland-based compan, has no substance. Their knowledge about India and especially AP seems to be very limited. As such interview with them did not enlighten any body. Then I am 67, from my experience in Nellore town of AP, I found this lightening was not from ages, but fairly recent ( within 5 to 10 years maximum ). And I do not know the scientific basis of lightening warning by SMS is good. The message comes 30 minutes or so before lightening strikes. But I cannot vouch for their accuracy since I do not monitor them for whole of Nellore District. But by word of mouth the warning messages are fairly accurate. Don't depend on foreign scientists who have not done specific studu in a region in India. It is waste. The scientists have pointed out in their interview that not much historical data is available on lightning strikes in the region. This is why they cannot say exactly how unprecedented this particular event was. Their organisation – Earth Networks – was roped in by the state government fairly recently to monitor and predict lightning activity in the region. Before this the state of Andhra Pradesh did not have any mechanism for this purpose. They are also providing the data for operating the App that sends in the alerts. The scientists are not fault in this because the government itself did not know about the recent increase in lightning strikes in the last 5-6 years as you have mentioned in your comment. Thank you for the information. I do not know AP govt gpt Earth Networks involved. But I was impresed by the SMS warning lightening occurence.